Is EUR/USD breaking higher despite the ECB’s dovish stance? In case you missed it, the European Central Bank (ECB) recently underscored its dovish stance by sharing that downside risks have proven “somewhat longer lasting” than previously expected. Draghi and his gang also said that it’s ready to “adjust all its instruments” in case of weaker growth and inflation prospects. Last but not the least, it doesn’t look like we’ll see any change in its low interest rates “at least through the end of 2019.” Yipes! Luckily for the euro bulls, the combo of M&A flows and better-than-expected trade data from China have inspired traders to look past the ECB’s dovishness. Right now, the burst of optimism is enough to bust EUR/USD above the falling channel that’s been containing the euro since the start of the year. What’s more, the resistance level was also supported by the SMAs and the top weekly ATR on the 4-hour time frame! 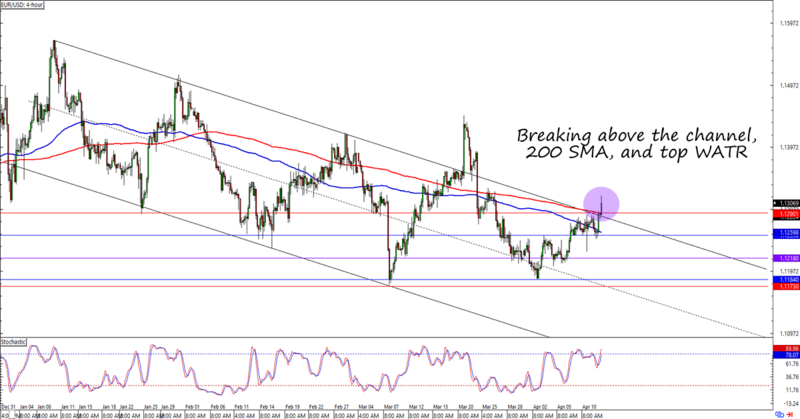 Are we seeing a legit upside breakout for EUR/USD? Or will today’s spike translate to a fakeout tomorrow? One look at the forex calendar told me that there are a bunch of PMI reports from the euro region next week. If they print to the upside, then I’ll consider putting small positions in anticipation of bullish momentum. But if next week’s data releases remind traders of why the ECB is so dovish, then I’ll look for entries for EUR/USD’s possible trip back to its downtrend. What about you? What’s your bias on EUR/USD? Think we’re seeing an upside breakout on the chart?